Ridge St Carpark is located in North Sydney. Toilet & shower facilities, and onsite parking available. 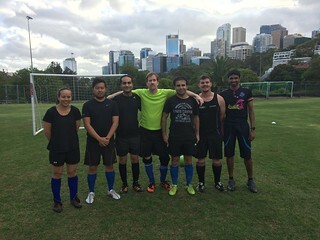 Tuesday Lunchtime – Mixed Soccer (Ridge St Carpark); 5 aside soccer, with max. 4 guys on the field. [/table]* Standard Fee is valid up till the Registration Close Date for the competition . The Late fee is applied to all teams who register after this date. 3. We will have Shinpad’s for sale ($10.00). 7. A Venue Manager with First Aid qualifications, a Soccer referee and Touch Football referee.